"We are a proudly bilingual nation," said Mr Jones. "We are confident the discussion we are launching today will continue to help us grow the language so it thrives as a vibrant, living part of our communities." Mr Davies added: "There are challenges ahead, but we can undoubtedly face those in the knowledge that we are building from a position of strength." The Welsh Government ran a "national conversation" consultation on the use of the Welsh language three years ago in 2013, following the Census results. Jamie Bevan, chairman of the Welsh language society Cymdeithas yr Iaith Gymraeg, said many reports had been commissioned and published since then but "not implemented in full". He said: "It's a shock that the government is beginning another consultation. "Welsh as a vibrant community language is on its knees - we're losing 3,000 speakers a year at the moment." Plaid Cymru's Sian Gwenllian welcomed the one million Welsh speakers pledge but said: "There's no need for another superficial stunt and there's no time to waste." Neil Hamilton, leader of the UKIP group in the Welsh Assembly, also welcomed the commitment but added: "We need action not words." 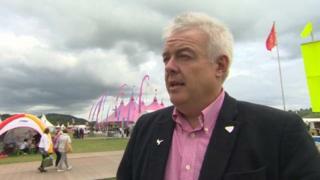 The Welsh Conservatives' Suzy Davies AM said the "devil will clearly be in the detail of these plans". In response to the claims that it was just another consultation, Mr Jones said: "The target didn't exist before the election. "A million is ambitious and it is important that we ensure that we listen to experts around us so that the target is met."